If this is the case: Why is surface tension considered or experienced as a force parallel to the interface while it is so obvious that it must be perpendicular to it? To see why this concentration gradient gives us a stress, and why this stress is in the plane of the surface, you can view the situation in two different pictures: the microscopic picture and the thermodynamic picture. The difference between the two pictures is that the microscopic picture views each particle as an object moving deterministically in the potential of each other object and basically uses newtonian mechanics to reason about what is going on. The thermodynamic picture doesn't care about the position of individual beads, but will only think about the total energy of the system. First let's consider the microscopic picture. In the bulk of the fluid (i.e., away from the surface) each particle has bounces around with the other particles. Since the particles make a fluid, we know they attract each other when they are far apart. On the other hand, if they get very close, they must repel each other, because you can't have two atoms taking up the exact same space. This means that a particle in the bulk is sometimes pulling on other particles and sometimes pushing on other particles. If the particles were pushing on each other more than pulling, then the liquid would expand, because everything is pushing against everything else, as if the liquid were trying to explode. Conversely, if all the particles were pulling on each other, the liquid would contract. This means that when the liquid is at its equilibrium density, the particles are on average pushing on each other as much as they are pulling on each other. Another way of thinking about this pushing and pulling is in terms of stress. If the particles are all pushing on each other, then that is called a positive or compressive stress, and if the particles are all pulling on each other that is called a negative or tensile stress. The conclusion of the previous paragraph is that particles in the bulk are under no stress. We also know that since the particles in the bulk are being pulled in all directions there is no net force on any particle. Notice the difference between stress and force. If a particle is being pulled left and right by the same amounts at the same time, then there is no net force, but there is a tensile stress. Now let's turn to the interface. We saw in the very first paragraph of this answer that the density at the interface is lower. This means that the particles are farther away from each other on average. Since they only repel when they are close, the particles on the surface must be pulling on each other more than pushing, so that there is a tensile stress in the surface. Also since there are more particles on the liquid side than on the gas side, a particle also feels a net force toward the liquid. Now the net force toward the liquid on the particle at the surface will not cause the interface to move because as the first particle is sucked back into the bulk of the liquid, another one will randomly bounce out of the liquid to take its place. However, the tension can be used to do work. Since all the particles at the surface are pulling on each other similar to stretched elastic sheet, that is exactly how the interface will behave. So if you have a soap film, for example, which is attached to a movable boundary, then the surface liquid particles adhered to the boundary will give a pull to the boundary and that pull will move the boundary inward, just as a stretched elastic sheet would. Notice here that all the relevant forces are in the plane of the sheet. This should hopefully explain the microscopic picture. 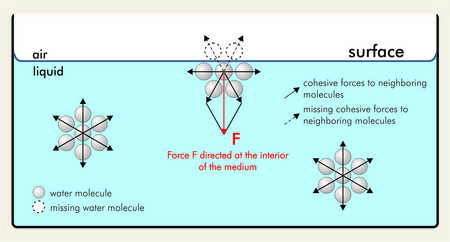 In the thermodynamic picture, I don't consider there being any net force on a bead at the surface. There is an energetic force in the direction of the liquid due to the interactions, but I consider this to be balanced by an entropic "diffusion" force generated by the concentration gradient. This diffusion force causes particles to want to move to high concentration to low concentration. Thus it points toward the gas. Thus in equilibrium, there is no force anywhere so nothing should change. However, there is a tension in the surface. This can be seen because a particle at the surface only experiences half the interaction energy it is supposed to. Thus there is a certain energy you have to pay to create a unit of surface area. The surface tension is exactly the constant of proportionality between energy and surface area. Since the energy doesn't change if you move the interface in the direction normal to the interface, there is no component of stress normal to the interface, so the stress is entirely in the plane of the interface. And it is a tensile stress because it wants to reduce the area, which is achieved by the interface contracting inward. As you can see in the image, when a water molecule reaches the surface there has been work done on that molecule via the Hydrogen Bonds, an electrostatic force. Where F is the work done by the electrostatic force or 'hydrogen bonds' and y is the distance along where the Force has acted (e.g. in a small spherical droplet the midpoint.) dm is the mass of a watermolecule. And as you can see the acceleration in the y-direction creates the force in the x-direction. Of note is that y is the depth to which the hydrogen bonds cannot be approximated to be equal on both sides, which is actually quite small. In other words surface tension isn't really strongly correlated with the depth of the body of water like the last equation suggests. TL;DR: The force parallel to the surface is created by a potential difference per horizontal distance caused by the electrostatic force in the perpendicular direction. Not the answer you're looking for? Browse other questions tagged surface-tension or ask your own question. What causes surface tension actually? What is the cause of the surface tension of the liquids? Resource(s) for developing a good understanding of surface tension? Why is there a $1/2$ factor in the surface tension for a thin film? What does Low Surface Tension mean? Is there an inverse for surface tension?